Posted on May 29, 2008 | Comments Off on Thwip! I don’t know how I missed this when it happened in real time, but I just learned the Library of Congress recently acquired — from an anonymous donor — the original pages from Amazing Fantasy #15, the first appearance of Spider-Man. The Library’s press release is here, and there’s an official LOC blog entry on it here. I gotta admit to getting a chuckle out the blogger’s surprise at the “excessively exclamatory” remarks kicking off the first Spider-Man story, though. That sort of stuff is only par for the course for Stan Lee. Speaking of . . . Stan Lee is one of the true innovators in comics, and remains Marvel’s greatest cheerleader and promoter. 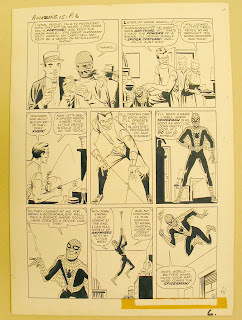 However, Spider-Man wouldn’t have been Spider-Man without the glorious pencils and inks of artist Steve Ditko. Click on the pic above to open the larger image — which includes the first time Peter Parker ever donned the familiar red and blue suit — and be dazzled. Great stuff. Kudos to the Library of Congress, and to the anonymous donor, for preserving this extraordinary piece of American culture. This entry was posted in library of congress, spider-man and tagged comics. Bookmark the permalink.